It’s Friday night, HMV Record Store in Harvard Square. The shock of electric guitar vibrates the CD shelf near a group of spectators who stand in front of a makeshift stage. In the center of that stage, Monique Ortiz is dressed in a black shirt and jeans. She takes the mike into a tight fist and belts out a tune. A singer/songwriter from the Boston rock scene, Ortiz is here to promote a newly released CD that includes her work along with 16 Grammy-nominated artists, including country diva Dolly Parton, folk icon Joan Baez, headliners like the Indigo Girls and Sarah McLachlan, as well as some of Boston’s top songstresses, who are nipping at their heels. Upcoming ‘Respond II’ concerts include a performance by Deb Talan, Merrie Amsterburg, Jennifer Kimball, and Monique Ortiz on April 24 at Club Passim, and Suzanne Vega with Kay Hanley at Boston’s Paradise Rock Club on May 30. Tickets for the Club Passim show are $15 ($13 for club members) and reservations are required. Call (617) 492-7679 for tickets and show times. Tickets for the Paradise show cost $25 and doors open at 8 p.m. Call (617) 423-NEXT for tickets, or visit http://www.NEXTticketing.com. For more information on ‘Respond,’ ‘Respond II,’ or the project’s beneficiaries, visit http://www.respondproject.org. “When I first found out about the project, I had no idea how big it was. Then I got the list with all the singers and I thought [gulp] … I’m not worthy,” said Ortiz. But she got involved because she believed in the cause. 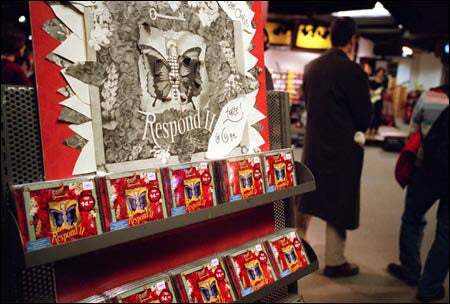 All proceeds from the “Respond II” CD go to support local and national programs that support victims of domestic abuse. Ortiz’s story is just one of many from the diverse and far-flung group of people – musicians, producers, lawyers, publicists, artists, Harvard students, and even Harvard faculty – who volunteered their time and talent to create, produce, and promote what could very well be the first CD ever to start its life cycle with an award-winning Harvard Business School (HBS) plan. The primary driver of the Respond II project is Charan Devereaux, a Kennedy School of Government graduate, who, three years ago, established the project template by pulling together a group of local musicians and industry professionals to produce the critically acclaimed “Respond” CD. Billed as “one of the most important and courageous records of the decade” by the editor-in-chief of Billboard Magazine, “Respond” has contributed $135,000 to date in support of its namesake, Respond Inc., one of the nation’s first domestic violence shelters, located in Somerville. When it came time for the sequel, the “Respond” production team was dreaming big and needed help. “We had done a local project and wanted to do another that would keep the same grassroots energy, but involve national and international artists, and expand the project’s benefits,” said Devereaux. The team had its eye on some of the nation’s top talent and a desire to expand the contributions to anti-domestic violence organizations. Devereaux turned to HBS and enlisted the help of two students, Sonya Brown and Michelle Dietz. Brown came to HBS with a background in radio, TV, and film study. Dietz, Brown’s roommate in college, had served on the board of a domestic violence support organization in Colorado before coming to Cambridge. 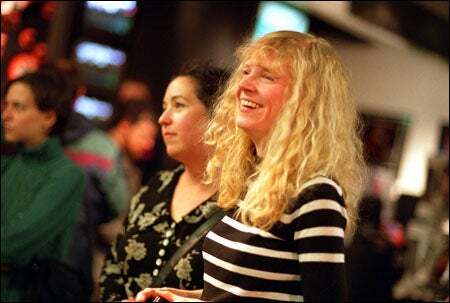 Devereaux, coordinator of open mike night at Harvard Square’s Club Passim, had strong connections with the Boston music world. With the support and encouragement of faculty advisers, the three proved the perfect team to perfect an already successful plan. Every year, Harvard Business School holds an annual competition for business plans. The trio entered the contest through the Social Enterprise Track. Introduced as a separate track in 2001, the Social Enterprise Track was created as a venue for students interested in developing plans for social-purpose ventures. Faculty involved with the project were “blown away” by the model that Devereaux had already established in creating “Respond,” which they called the quintessential social marketing project success. With “Respond,” she had figured out how to create value for the nonprofit, the musicians, and the customers. All the team needed now was to take that great idea and think through the operational issues. The project was runner-up in the competition. Monique Ortiz performs at opening. By the time the project was well underway about a year later, some 70 people and a number of businesses were freely donating their time and expertise. Many, including Devereaux, were fueling the project while holding down full-time jobs. The team recruited top national and local artists to contribute their music and secured pro bono services of a local entertainment lawyer who helped with contracts. Dietz and Brown, as co-producers, were managing finances and “turning over every stone,” to see how the project could be marketed and promoted. Artists and producers from “Respond” returned to pitch in, designing the CD cover and selecting and arranging tracks. Starbucks, Amazon, Barnes & Noble, and Yahoo! were kicking in free marketing services, playing the “Respond II” CD in stores, and donating online banner ads. “A lot of people really took on the project, otherwise we could not have done it on the scale that we did,” said Devereaux. The CD, a two-volume collection whose sales will support Respond Inc. and a national organization called The Family Violence Prevention Fund, was released to critical acclaim in January. The Boston Globe called “Respond II” “a match made in heaven,” with music lovers getting a remarkable collection of songs and an important issue getting attention and financial support. Others commented on the complement of music, which takes disparate musical elements – folk, blues, soul, country, hard rock, Latin beat – to produce one powerful multi-genre spectrum of performers. Now the team has turned its focus on promoting the new CD. It’s already been featured on NPR and other college radio stations, and a series of music house promotions and concerts are coming up, including a May concert featuring Suzanne Vega. With this kind of grassroots momentum, you can’t help but wonder, will there be a “Respond III”? “I’m sure this is like having a baby – at the time you think, ‘never again,’ but after a while you start wondering, ‘maybe just one more,'” said Devereaux.